This message appears on computers which are running out of available RAM during rendering. It is triggered by Windows reporting low free memory. Once memory runs out, 3ds Max might either crash, or start paging memory onto hard drive, resulting in extremely slow parsing and rendering. 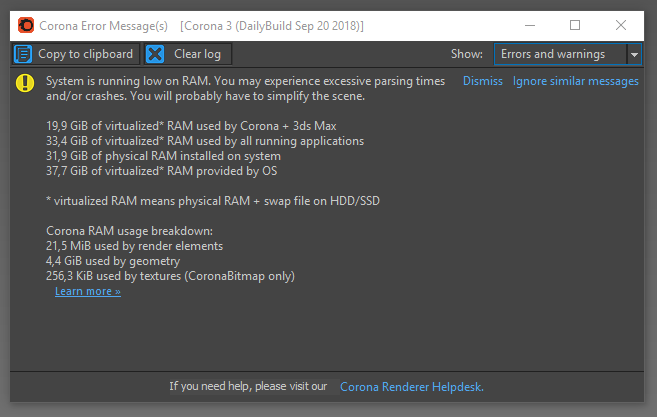 In Corona Renderer 3 and newer, the "System is running low on RAM" error message will display a breakdown of various rendering components and their RAM usage. This provides the user with information what exactly should be optimized to lower the RAM usage. Note: disabling the VFB may also help (Render setup > System > System Settings > VFB Settings > Type: none), however the memory saving may be negligible. Solution: do not use very high displacement settings unless it's absolutely necessary. Usually the screen size can be left at the default value. It should never be set to less than 1. Higher values mean lower quality. Always use autobump. Solution: use less detailed displacement maps. Let bump take care of fine detail. Autobump does that automatically. Solution: optimize scene geometry if possible and reduce the amount of objects. Use instancing whenever possible. Additionally "Low memory" option can be enabled in the Development/Experimental stuff rollout. This will slightly reduce RAM usage, but will also slow down rendering by about 5%. I am getting a sudden rise in RAM usage!